Today is Canada Day and HKSAR day... the 21st anniversary of Hong Kong's return to the motherland. The best way to celebrate? 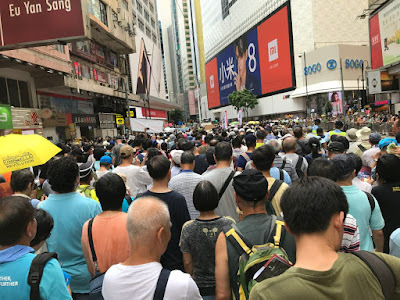 March in protest against the Hong Kong government! 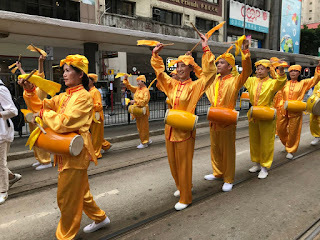 When we arrived at Victoria Park from the Tin Hau MTR station, the football pitches were set up for a pro-Beijing Hong Kong Celebrations Association featuring a lion dance exhibition with many tents, but hardly anyone there. There was a joke that people were being paid to show up there. Meanwhile next to the pitches is a lawn area that wasn't full, but had a few thousand people already gathered. 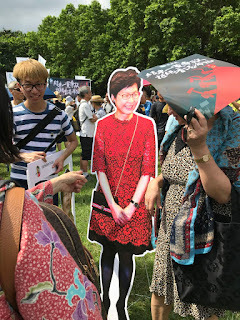 Chief Executive Carrie Lam Cheng Yuet-ngor was there -- in the form of a cardboard cut out, while other people held up banners for their specific causes. A significant one demanded that Liu Xia, the wife of Nobel Laureate Liu Xiaobo be freed from house arrest. Almost as soon as we arrived, organizers encouraged us to leave at 3pm on the dot, walking towards Tin Hau and then turning right onto Hennessy Road. Getting out of Victoria Park was OK, and at the beginning we walked quite quickly. But soon we came to a complete stop and crawled along Hennessy Road. In fact it took an hour and a half just to walk out of Causeway Bay and into Wan Chai. Weather-wise it was slightly overcast, with periodic breezes which was nice. For a few seconds some raindrops fell. Periodically someone on loud speakers would encourage marchers to chant slogans, but for the most part the street was lined with political parties and social groups soliciting for donations which got a bit too much. 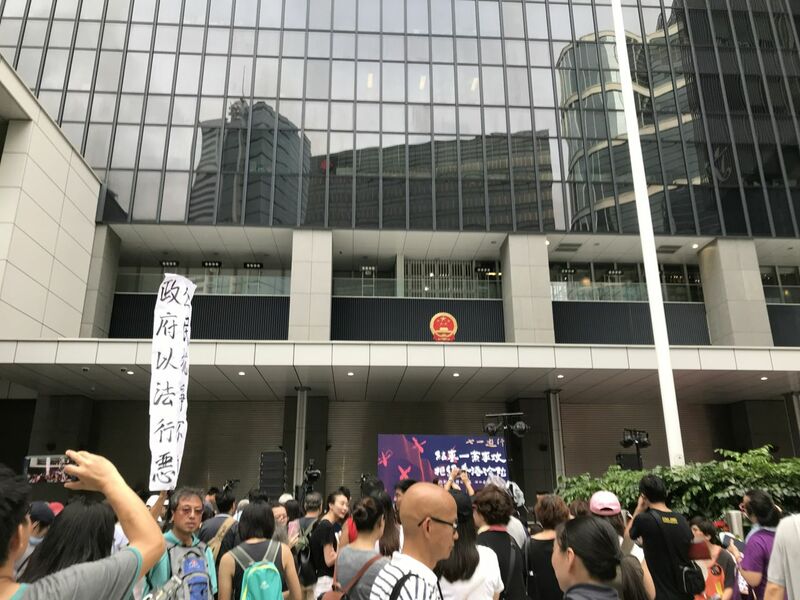 We saw people like Lee Cheuk-yan of the Labour Party, League of Social Democrats' Lau Siu-lai who was ousted from the Legislative Council, and Joshua Wong Chi-fung of Demsisto give speeches and then less than an hour later we saw them again in Wan Chai. It wasn't just political parties, but every other cause under the sun, from human rights, to animal rights, saving Lantau, to recycling and stop shopping. Domestic helpers demanded more money and there was even a group supporting North Korean defectors. The constant barrage of voices on microphones was nauseating, combined with the heat and having to walk slow wasn't much fun. We were also joined by the Falun Gong which was awkward. We could hear a marching band behind us and it was a coordinated group of people in blue and yellow satin outfits, banging on drums and playing trumpets, clarinets and saxophones wearing white gloves. We didn't want to be associated with them, but they were marching at a good pace that made us jealous! Nevertheless, by the time we got to Admiralty, things were looking up and we were walking at a good pace to the border with Central and then we turned right to make a loop towards Tamar. Here we were stopped so that cars could go by and behind me I could see lots of people waiting like us. Organizers estimated around 50,000 people, lower than last year, but my friend YTSL begs to differ as she has marched every year in the last several years. She says definitively that this year there were many more people than last year, which organizers had said 60,000 people showed up. So how could this year only be 50,000?! The police had the gall to say only 9,000 people marched. 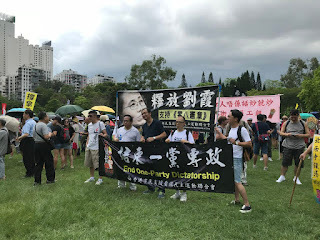 When we reached Tamar, we were actually allowed to go into Civic Square, which was a strange sensation as it had always been locked up during then leader Leung Chun-ying's time. It was a bit of an anti-climax ending the march here and then having to wait for the rest of the marchers to come before a rally would be held. I decided to leave early and went home, sweaty and tired, but happy to be counted with the discontented.